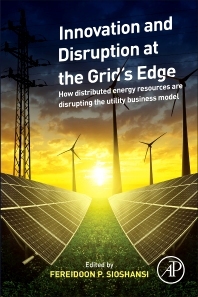 Innovation and Disruption at the Grid’s Edge examines the viable developments in peer-to-peer transactions enabled by open platforms on the grid’s edge. With consumers and prosumers using more electronic platforms to trade surplus electricity from rooftop solar panels, share a storage battery, or use smart gadgets that manage load and self-generation, the grid's edge is becoming crowded. The book examines the growing number of consumers engaging in self-generation and storage, and analyzes the underlying causes and drivers of change, as well as the implications of how the utility sector—particularly the distribution network—should/could be regulated. The book also explores how tariffs are set and revenues are collected to cover both fixed and variable costs in a sustainable way. This reference is useful for anyone interested in the areas of energy generation and regulation, especially stakeholders engaged in the generation, transmission, and distribution of power. 5. Grid vs. distributed solar: What does Australia’s experience say about the competitiveness of distributed energy? Dr. Fereidoon Sioshansi is President of Menlo Energy Economics, a consulting firm based in San Francisco with over 35 years of experience in the electric power sectore working in analysis of energy markets, specializing in the policy, regulatory, technical and environmental aspects of the electric power sector in the US and internationally. His research and professional interests are concentrated in demand and price forecasting, electricity market design, competitive pricing & bidding, integrated resource planning, energy conservation and energy efficiency, economics of global climate change, sustainability, energy security, renewable energy technologies, and comparative performance of competitive electricity markets. Dr. Sioshansi advises major utility clients and government policy makers domestically and internationally on electricity market reform, restructuring and privatization of the electric power sector. He has published numerous reports, books, book chapters and papers in peer-reviewed journals on a wide range of subjects. His professional background includes working at Southern California Edison Co. (SCE), Electric Power Research Institute (EPRI), NERA, and Global Energy Decisions. He is the editor and publisher of EEnergy Informer, a monthly newsletter with international circulation. He is on the Editorial Advisory Board of The Electricity Journal where he is regularly featured in the “Electricity Currents” section. Dr. Sioshansi also serves on the editorial board of Utilities Policy and is a frequent contributor to Energy Policy. Since 2006, He has edited nine books on related topics with Elsevier.